An easy Christmas standby to make in advance and keep in the freezer. Serve with warm chocolate sauce, Christmas pudding or fresh fruit. Place the Florentines in a medium-sized polythene bag and seal or tie loosely. Use a rolling pin to crush into small pieces. Pour the cream into a large bowl and whip gently with an electric or balloon whisk until it has just started to thicken. Take care not to over-whip. Use a metal spoon to carefully fold the custard, Baileys and Florentine pieces into the cream. Pour the ice cream mixture into a 2-litre shallow, freezerproof container, cover and place in the freezer. After 1 hour, remove from the freezer and, using a fork, fold the frozen edges into the rest of the mixture. Return to the freezer for a further 2-3 hours until the ice cream has set, repeating the folding process about 3-4 times to keep breaking up the ice crystals. Either serve straight away or, if making in advance, allow the ice cream to soften in the fridge for about an hour before serving. 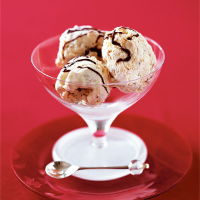 Serve in scoops, drizzled with gently warmed chocolate sauce. Florentines are easier to crush if they are chilled first. Try substituting other liqueurs, such as Tia Maria or Kahlúa. The ice cream will keep in an airtight freezer-proof container for up to 4 weeks. Best served with Baileys on ice.